Grammar and Syntax are usually taken in similar meaning. Yes they are but there is slight difference as well. In grammar we are normally more concerned with parts of speech , word etymology and derivations and tenses. In Syntax our focus is on arrangement. The right arrangement of words to make meaningful words and right arrangements of phrases to coin meaningful sentences. All and only criteria says the rules should be crafted in such a way that they should include all the valid sentences and should not include any invalid sentence. In other words, you can put it this way that the rules should be accurate to include all the false negatives and exclude all the false positives. For instance let’s take a phrase “near london”. Based on this phrase if we make a rule that PP (preposition phrase) will be preposition following by noun then we make come up with some false positives like “near car” or “near city”. Here the problem is we should write the common noun following by an article (a, an, the). So we have to change the rule that common noun would be followed by an article whereas the proper noun and pronoun do no need any article. So this rule will include all and only the valid phrases. They say, there are two meaning for every sentence. The apparent meaning and the meaning in between the lines. The structure for apparent meaning is referred to as surface structure and the structure for the deeper meaning or essence of the sentence is called the deeper structure. Example: “Salim killed Sher Ali.” “Sher Ali was killed by Salim”. These are two different ways to communicate the same message. So these are two surface structures for same message (deep structure). Even if we it interrogative as “Did Salim kill Sher Ali?” or “Was Sher Ali killed by Salim?” the deep structure would remain the same. The search engines usually try to present result based upon deep structures instead of surface structures. Sometime structural ambiguity is found in sentence that even human can not understand them. Most of the time a verb, noun or pronoun can be linked with two different nouns. So the reader finds himself confused. Examples: “A clerk at a butcher shop stands five feet ten inches tall and wears size 13 sneakers. What does he weigh? ” What would be answer? You may be confused as how can you know the weight of that clerk. The reason is, the first part of the sentence we are told about height and foot size of the clerk. So we start thinking about his weight. We forget that the clerk is actually at the butcher shop and he must be weighing meat. Here the confusion was created as the verb “weigh” can be linked to both clerk and meat. “In British Columbia you cannot take a picture of a man with a wooden leg. Why not?” Now here we feel confused why we can’t take picture of a man who has wooden leg. The reason is we have wrongly attribute the wooden leg to a man. If simplify the sentence as “you can not take picture with a wooden leg”. It has clear meaning. We need a camera instead of wooden leg to take a picture. Here the confusion arises when we wrongly relate “wooden leg” with a man. “She bumped into a man with umbrella.” Here again we have two meanings. “She was holding the umbrella” or “The man was holding umbrella”. The reason is, umbrella can be related with both “the man” and “she”. 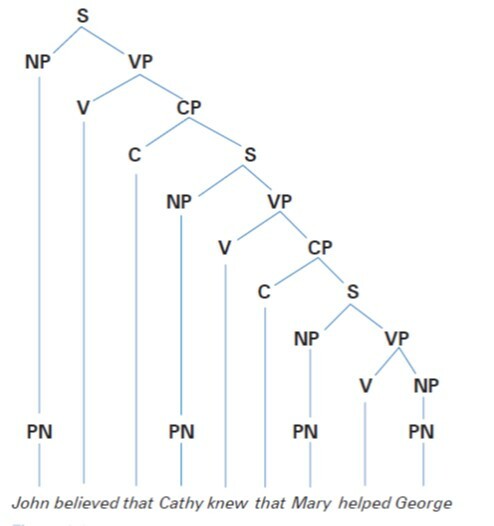 Syntax tree is a visual form to represent a sentence by its parts of speech. In every language there are rules of arrangement (Syntax). These rules are technically called Lexical Rules. By using the lexical rules and the words from dictionary(which is technically called lexicon) we coin new sentence. 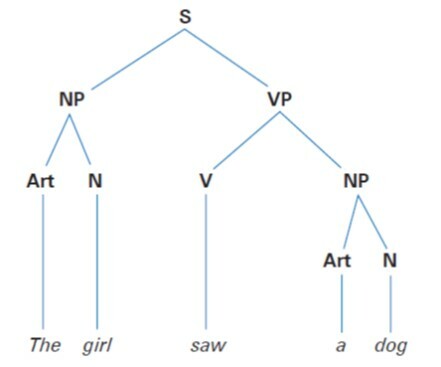 When we break down the given sentence using lexical rules and lexicon and then represent it in a tree form, it is called parse tree or Syntax tree. Symbols used in Syntactic Structure. We use abbreviations or initials for parts of speech and use symbols for defining lexical rules. Making New Sentences Using Lexical Rules and Lexicon. Let’s say we have following lexical rules. Here is some sample vocabulary or lexicon. Now, using the lexical rules and lexicon we can coin new sentences. VP–> V NP = V Art N = followed the boy. We “got followed” from Verb list, “the” from article list and “boy” from noun list of above sample lexicon. By using above lexicon and lexical rules we can make many valid sentences. Recursion is very common feature of a language. We can recursively include sentences within sentences. For instance say. “He was sitting in his room on the chair new the bed in his room in lahore at 10 am.” We can even extend this recursive behavior as long as we can. Similarly an other example might be. Cathy knew that Mary helped George. John believed that Cathy knew that Mary helped George.